Billericay Town Centre is a designated Conservation Area. The High Street, which is lined with shops and commercial premises, comprises a collection of traditional and more modern buildings which are occupied by a mix of national and local retailers as well as pubs and restaurants. The Town's well established character and appearance derives from the quality and relationship of buildings in the area. Architectural features such as distinctive windows, doors and and other characteristic details are very important to Billericay's distinctive historic character and must be protected. 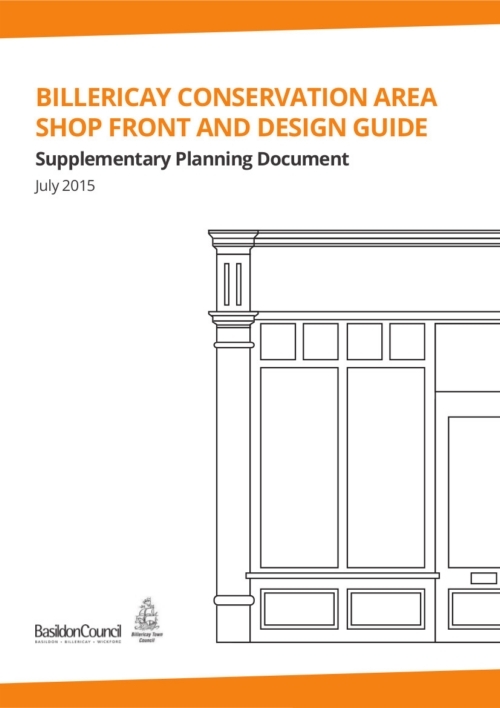 The Design Guide has been produced to give advice to residents, property owners, landlords and tenants on shop fronts, advertisements and alterations to buildings within Billericay. it applies to the whole of the Billericay Conservation Area. It has been adopted as a Supplementary Planning Document (SPD) by Basildon Council and is a material consideration when determining appropriate applications for development, listed buildings and advertisement. Click on the Design Guide to read more.